The by-election will take place next month. 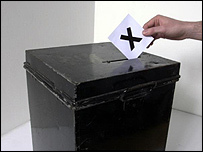 Five candidates have declared their intention to stand in the Goodrington by-election in Torbay. The seat has become vacant because of the resignation of the deputy leader of Torbay Council, Andrea Colborne. The Goodrington with Roselands ward has two council seats. At the last election two liberal democrats were elected, including Andrea Colborne. Now one of the seats has become vacant, with her resignation. The by-election will take place next month. The candidates are: Michael Turner, British National Party; Colin Hurst, Conservative; John Mellor, Labour; Thomas Pentney, Liberal Democrat; Mark Dent, UK Independence Party.